Saints preserve us! 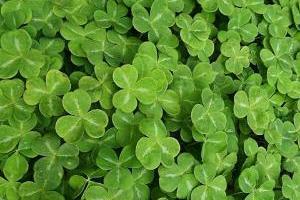 Thanks to a fairly strong winter by Irish standards, as well as some changes to traditional farming methods that have endangered its natural habitat, the actual shamrock (Trifolium dubium or lesser trefoil) used to mark St. Patrick’s Day in Ireland is facing a severe shortage. That’s right; to get their shamrocks the people of Ireland may be turning to England or putting on fake shamrock lookalike plants. Apparently, not all three-leafed green clover-looking plants are shamrocks. Only the lesser trefoil is a true shamrock. The other plants, Trifolium repens (white clover) and Medicago lupulina (black medic), are actually fake shamrocks, if you believe Dr. Declan Doogue, a botanist at the Royal Irish Academy. Most people don’t know the difference just by looking at them which is which. Apparently the white clover is the plant most likely to be misidentified as a shamrock due to the fact it grows everywhere. That must be the plant infesting my backyard right now. Fake shamrock or real clover, so long as I can get my Shamrock Shake I’ll be all right.